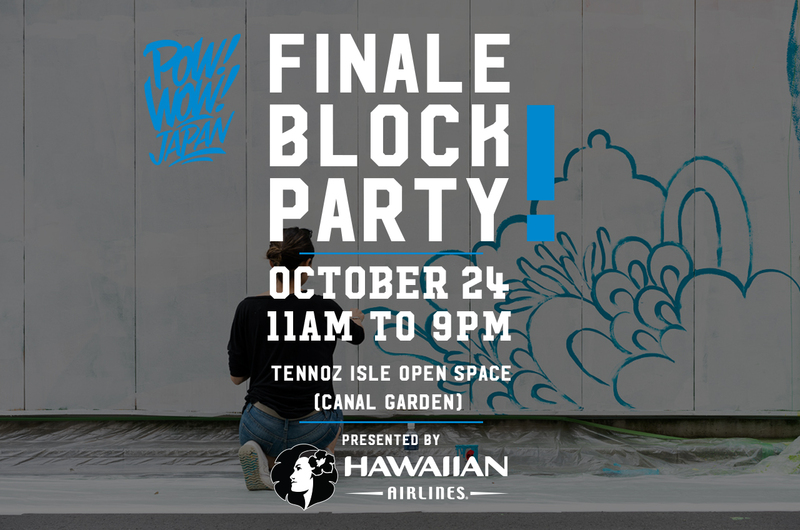 Presented by Hawaiian Airlines, don’t miss the Finale Block Party of the inaugural POW! WOW! Japan 2015. It’s happening at the Tennoz Isle Open Space in Tokyo from 11am to 9pm. Come and enjoy live music, art, food and tons more. 11:00AM-12:30PM – Block Party Opens. 12:30PM-1:00PM – First set of Hawaiian Serenaders. 2:30PM-3:00PM – Second set of Hawaiian Serenaders. 3:00PM-4:00PM – Mini Drone Race (Tentative). 5:00PM-6:00PM – Third set of Hawaiian Serenaders. 6:00PM-6:30PM – POW! WOW! School of Music Performance. 6:30PM-7:00PM – Shing02 and Spin Master A-1 Live Performance. 7:00PM-7:45PM – TOKURA Free Style Juggling Perfomance. 7:45PM-8:45PM – BOND STREET LIVE PAINTING BLACK OUT!